FCA US LLC, doing business as Chrysler, (/ˈkraɪslər/) is one of the "Big Three" automobile manufacturers in the United States, headquartered in Auburn Hills, Michigan. The original Chrysler Corporation was founded in 1925 by Walter Chrysler from the remains of the Maxwell Motor Company. In 1998, it was acquired by Daimler-Benz, and the holding company was renamed DaimlerChrysler. After Daimler divested Chrysler in 2007, the company existed as Chrysler LLC (2007–2009) and Chrysler Group LLC (2009–2014) before merging in 2014 with Fiat S.p.A. and becoming a subsidiary of its successor Fiat Chrysler Automobiles. In addition to the Chrysler brand, FCA sells vehicles worldwide under the Dodge, Jeep, and Ram nameplates. Furthermore, the subsidiary includes Mopar, its automotive parts and accessories division, and SRT, its performance automobile division. After founding the company, Walter Chrysler used the General Motors brand diversification and hierarchy strategy that he had seen working for Buick, and acquired Fargo Trucks and Dodge Brothers, and created the Plymouth and DeSoto brands in 1928. Facing postwar declines in market share, productivity, and profitability, as GM and Ford were growing, Chrysler borrowed $250 million in 1954 from Prudential Insurance to pay for expansion and updated car designs. On January 1, 2014, Fiat S.p.A announced a deal to purchase the rest of Chrysler from the United Auto Workers retiree health trust. The deal was completed on January 21, 2014, making Chrysler Group a subsidiary of Fiat S.p.A. In May 2014, Fiat Chrysler Automobiles was established by merging Fiat S.p.A. into the company. This was completed in August 2014. Chrysler Group LLC remained a subsidiary until December 15, 2014, when it was renamed FCA US LLC, to reflect the Fiat-Chrysler merger. Chrysler had arrived at the ailing Maxwell-Chalmers company in the early 1920s, hired to overhaul the company's troubled operations (after a similar rescue job at the Willys-Overland car company). In late 1923 production of the Chalmers automobile was ended. In January 1924, Walter Chrysler launched the well-received Chrysler automobile. The 6-cylinder Chrysler was designed to provide customers with an advanced, well-engineered car, was an automobile at an affordable price. Elements of this car are traceable to a prototype which had been under development at Willys during Chrysler's tenure The original 1924 Chrysler included a carburetor air filter, high compression engine, full pressure lubrication, and an oil filter, features absent from most autos at the time. Among the innovations in its early years were the first practical mass-produced four-wheel hydraulic brakes, a system nearly completely engineered by Chrysler with patents assigned to Lockheed, and rubber engine mounts to reduce vibration. The Maxwell brand was dropped after the 1925 model year, with the new, lower-priced four-cylinder Chryslers introduced for the 1926 year being badge-engineered Maxwells. The advanced engineering and testing that went into Chrysler Corporation cars helped to push the company to the second-place position in U.S. sales by 1936, which it held until 1949. In 1928, the Chrysler Corporation began dividing its vehicle offerings by price class and function. The Plymouth brand was introduced at the low-priced end of the market (created essentially by once again reworking and rebadging Chrysler's four-cylinder model). At the same time, the DeSoto brand was introduced in the medium-price field. Also in 1928, Chrysler bought the Dodge Brothers automobile and truck company and continued the successful Dodge line of automobiles and Fargo range of trucks. By the mid-1930s, the DeSoto and Dodge divisions would trade places in the corporate hierarchy. On April 28, 1955, Chrysler and Philco had announced the development and production of the World's First All-Transistor car radio. The all-transistor car radio, Mopar model 914HR, was developed and produced by Chrysler and Philco, and it was a $150.00 "option" on the 1956 Imperial automobile models. Philco began manufacturing this radio in the fall of 1955 at its Sandusky Ohio plant. On September 28, 1957, Chrysler had announced the first production electronic fuel injection (EFI), as an option on some of its new 1958 car models (Chrysler 300D, Dodge D500, DeSoto Adventurer, Plymouth Fury). The first attempt to use this system was by American Motors on the 1957 Rambler Rebel. Bendix Corporation's Electrojector used a transistor computer brain modulator box, but teething problems on pre-production cars meant very few cars were made. The EFI system in the Rambler ran fine in warm weather, but suffered hard starting in cooler temperatures and AMC decided not to use this EFI system, on its 1957 Rambler Rebel production cars that were sold to the public. Chrysler also used the Bendix "Electrojector" fuel injection system and only around 35 vehicles were built with this option, on its 1958 production built car models. Owners of EFI Chryslers were so dissatisfied that all but one were retrofitted with carburetors (while that one has been completely restored, with original EFI electronic problems resolved). The Valiant was also introduced for 1960 as a distinct brand. In the U.S. market, Valiant was made a model in the Plymouth line for 1961 and the DeSoto make was discontinued in 1961. With those exceptions per applicable year and market, Chrysler's range from lowest to highest price from the 1940s through the 1970s was Valiant, Plymouth, Dodge, DeSoto, Chrysler, and Imperial. Chrysler struggled to adapt to the changing environment of the 1970s. When consumer tastes shifted to smaller cars in the early 1970s, particularly after the 1973 oil crisis, Chrysler could not meet the demand. Additional burdens came from increased US import competition, and tougher government regulation of car safety, fuel economy, and emissions. As the smallest of the Big 3 US automakers, Chrysler lacked the financial resources to meet all of these challenges. In 1978, Lee Iacocca was brought in to turn the company around, and in 1979 Iacocca sought US government help. Congress later passed the Loan Guarantee Act providing $1.5 billion in loan guarantees. The Loan Guarantee Act required that Chrysler also obtain $2 billion in concessions or aid from sources outside the federal government, which included interest rate reductions for $650 million of the savings, asset sales of $300 million, local and state tax concessions of $250 million, and wage reductions of about $590 million along with a $50 million stock offering. $180 million was to come from concessions from dealers and suppliers. After a period of plant closures and salary cuts agreed to by both management and the auto unions, the loans were repaid with interest in 1983. In November 1983, the Dodge Caravan/Plymouth Voyager was introduced, establishing the minivan as a major category, and initiating Chrysler's return to stability. In 1985, Chrysler entered an agreement with AMC to produce Chrysler M platform rear-drive, as well as Dodge Omnis front wheel drive cars, in AMC's Kenosha, Wisconsin plant. In 1987, Chrysler acquired the 47% ownership of AMC that was held by Renault. The remaining outstanding shares of AMC were bought on the NYSE by August 5, 1987, making the deal valued somewhere between US$1.7 billion and US$2 billion, depending on how costs were counted. Chrysler CEO Lee Iacocca wanted the Jeep brand, particularly the Jeep Grand Cherokee (ZJ) that was under development, the new world-class manufacturing plant in Bramalea, Ontario, and AMC's engineering and management talent that became critical for Chrysler's future success. Chrysler established the Jeep/Eagle division as a "specialty" arm to market products distinctly different from the K-car-based products with the Eagle cars targeting import buyers. Former AMC dealers sold Jeep vehicles and various new Eagle models, as well as Chrysler products, strengthening the automaker's retail distribution system. In 1998, Chrysler and its subsidiaries entered into a partnership dubbed a "merger of equals" with German-based Daimler-Benz AG, creating the combined entity DaimlerChrysler AG. To the surprise of many stockholders, Daimler acquired Chrysler in a stock swap before Chrysler CEO Bob Eaton retired. It is widely accepted that the merger was needed because of Eaton's lack of planning for Chrysler in the 1990s, to become their own global automotive company. Under DaimlerChrysler, the company was named DaimlerChrysler Motors Company LLC, with its U.S. operations generally called "DCX". The Eagle brand was retired soon after Chrysler's merger with Daimler-Benz in 1998 Jeep became a stand-alone division, and efforts were made to merge the Chrysler and Jeep brands as one sales unit. In 2001, the Plymouth brand was also discontinued. On May 14, 2007, DaimlerChrysler announced the sale of 80.1% of Chrysler Group to American private equity firm Cerberus Capital Management, L.P., thereafter known as Chrysler LLC, although Daimler (renamed as Daimler AG) continued to hold a 19.9% stake. The economic collapse of 2007 - 2009 pushed the fragile company to the brink. On April 30, 2009, the automaker filed for Chapter 11 bankruptcy protection to be able to operate as a going concern, while renegotiating its debt structure and other obligations, which resulted in the corporation defaulting on over $4 billion in secured debts. The U.S. government described the company's action as a "prepackaged surgical bankruptcy". On June 10, 2009, substantially all of Chrysler's assets were sold to "New Chrysler", organized as Chrysler Group LLC. The federal government provided support for the deal with US$8 billion in financing at near 21%. Under CEO Sergio Marchionne, "World Class Manufacturing" or WCM, a system of thorough manufacturing quality, was introduced and several products re-launched with quality and luxury. The 2010 Jeep Grand Cherokee very soon became the most awarded SUV ever. The Ram, Jeep, Dodge, SRT and Chrysler divisions were separated to focus on their own identity and brand, and 11 major model refreshes occurred in 21 months. The PT Cruiser, Nitro, Liberty and Caliber models (created during DCX) were discontinued. On May 24, 2011, Chrysler repaid its $7.6 billion loans to the United States and Canadian governments. The US Treasury, through the Troubled Asset Relief Program (TARP), invested $12.5 billion in Chrysler and recovered $11.2 billion when the company shares were sold in May 2011, resulting in a $1.3 billion loss. On July 21, 2011, Fiat bought the Chrysler shares held by the US Treasury. The purchase made Chrysler foreign-owned again, this time as the luxury division. The Chrysler 300 was badged Lancia Thema in some European markets (with additional engine options), giving Lancia a much needed replacement for its flagship. On December 16, 2014, Chrysler Group LLC announced a name change to FCA US LLC. On January 12, 2017, FCA shares traded at the New York Stock Exchange lost value after the EPA accused FCA US of using emissions cheating software to evade diesel-emissions tests, however the company countered the accusations, and the chairman and CEO Sergio Marchionne sternly rejected them. The following day, shares rose as investors played down the effect of the accusations. Analysts gave estimates of potential fines from several hundred million dollars to $4 billion, although the likelihood of a hefty fine was low. Senior United States Senator Bill Nelson urged the FTC to look into possible deceptive marketing of the company's diesel-powered SUVs. Shares dropped 2.2% after the announcement. On July 21, 2018, Sergio Marchionne stepped down as chairman and CEO for health reasons, and was replaced by John Elkann and Michael Manley, respectively. As a result of ending domestic production of more fuel-efficient passenger automobiles such as the Dodge Dart and Chrysler 200 sedans, FCA US elected to pay $77 million in fines for violating the anti-backsliding provision of fuel economy standards set under the Energy Independence and Security Act of 2007 for its model year 2016 fleet. As part of a January 2019 settlement, Fiat Chrysler will recall and repair approximately 100,000 automobiles equipped with a 3.0-liter V6 EcoDiesel engine having a prohibited defeat device, pay $311 million in total civil penalties to US regulators and CARB, pay $72.5 million for state civil penalties, implement corporate governance reforms, and pay $33.5 million to mitigate excess pollution. The company will also pay affected consumers up to $280 million and offer extended warranties on such vehicles worth $105 million. The total value of the settlement is worth about $800 million, though FCA did not admit liability, and it did not resolve an ongoing criminal investigation. Chrysler is the smallest of the "Big Three" U.S. automakers (Chrysler Group LLC, Ford Motor Company, and General Motors). In 2013 Chrysler sold 1,800,368 vehicles, 9% up from 2012, and fourth largest in sales behind GM, Ford and Toyota. Chrysler's sales have fluctuated dramatically over the last decade. In 2007 sales reached 2,076,650, falling to 931,402 units in 2009, the company's worst result in decades. It is reported that Chrysler was heavy on fleet sales in 2010, hitting as high as 56 percent of total sales in February of that year. For the whole year, 38 percent of sales of Chrysler were to fleet customers. The industry average was 19 percent. However, the company hopes to reduce its fleet sales to the industry average in 2011 with a renewed product lineup. Chrysler is the world's 11th largest vehicle manufacturer as ranked by OICA in 2012. Total Chrysler vehicle production was about 2.37 million that year, up from 1.58 million in 2010. In 2007, Chrysler began to offer vehicle lifetime powertrain warranty for the first registered owner or retail lessee. The deal covered owner or lessee in U.S., Puerto Rico and the Virgin Islands, for 2009 model year vehicles, and 2006, 2007 and 2008 model year vehicles purchased on or after July 26, 2007. Covered vehicles excluded SRT models, Diesel vehicles, Sprinter models, Ram Chassis Cab, Hybrid System components (including transmission), and certain fleet vehicles. The warranty is non-transferable. After Chrysler's restructuring, the warranty program was replaced by five-year/100,000 mile transferrable warranty for 2010 or later vehicles. In 2008, as a response to customer feedback citing the prospect of rising gas prices as a top concern, Chrysler launched the "Let's Refuel America" incentive campaign, which guaranteed new-car buyers a gasoline price of $2.99 for three years. With the U.S. purchase of eligible Chrysler, Jeep, and Dodge vehicles, customers could enroll in the program and receive a gas card that immediately lowers their gas price to $2.99 a gallon, and keeps it there for the three years. In October 2009, Dodge's car and truck lines were separated, with the name "Dodge" being used for cars, minivans and crossovers and "Ram" for light- and medium-duty trucks and other commercial-use vehicles. In 2011, Chrysler unveiled their "Imported From Detroit" campaign with ads featuring Detroit rapper Eminem, one of which aired during the Super Bowl. The campaign highlighted the rejuvenation of the entire product lineup, which included the new, redesigned and repackaged 2011 200 sedan and 200 convertible, the Chrysler 300 sedan and the Chrysler Town & Country minivan. As part of the campaign, Chrysler sold a line of clothing items featuring the Monument to Joe Louis, with proceeds being funneled to Detroit-area charities, including the Boys and Girls Clubs of Southeast Michigan, Habitat for Humanity Detroit and the Marshall Mathers Foundation. Following the Eminem ad, there was also an ad for Detroit Lions defensive tackle Ndamukong Suh driving a Chrysler 300 to Portland, Oregon, to visit his mother, an ad featuring Detroit-born fashion designer John Varvatos cruising through a shadowy Gotham while Kevin Yon's familiar baritone traces the designer's genesis. 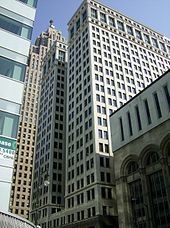 In March 2011, Chrysler Group LLC filed a lawsuit against Moda Group LLC (owner of Pure Detroit clothing retailer) for copying and selling merchandise with the "Imported from Detroit" slogan. Chrysler claimed it had notified defendant of its pending trademark application February 14, but the defendant argued Chrysler had not secured a trademark for the "Imported From Detroit" phrase. On June 18, 2011, U.S. District Judge Arthur Tarnow ruled that Chrysler's request did not show that it would suffer irreparable harm or that it had a strong likelihood of winning its case. Therefore, Pure Detroit's owner, Detroit retailer Moda Group LLC, can continue selling its "Imported from Detroit" products. Tarnow also noted that Chrysler does not have a trademark on "Imported from Detroit" and rejected the automaker's argument that trademark law is not applicable to the case. In March 2012, Chrysler Group LLC and Pure Detroit agreed to a March 27 mediation to try to settle the lawsuit over the clothing company's use of "Imported from Detroit" slogan. Pure Detroit stated that Chrysler has made false claims about the origins of three vehicles - Chrysler 200, Chrysler 300 and Chrysler Town & Country - none of which are built in Detroit. Pure Detroit also said that Chrysler's Imported From Detroit merchandise is not being made in Detroit. In 2012 Chrysler and Pure Detroit came to an undisclosed settlement. Chrysler's Jefferson North Assembly, which makes the Jeep Grand Cherokee and Dodge Durango, is the only car manufacturing plant of any company remaining entirely in Detroit (General Motors operates a plant which is partly in Detroit and partly in Hamtramck). In 2011, Eminem settled a lawsuit against Audi alleging the defendant had ripped off the Chrysler 300 Super Bowl commercial in the Audi A6 Avant ad. Again in 2012, Chrysler advertised during the Super Bowl. Its two-minute February 5, 2012 Super Bowl XLVI advertisement was titled "Half Time in America". The ad drew criticism from several leading U.S. conservatives, who suggested that its messaging implied that President Barack Obama deserved a second term and, as such, was political payback for Obama's support for the federal bailout of the company. Asked about the criticism in a 60 Minutes interview with Steve Kroft, Sergio Marchionne responded "just to rectify the record I paid back the loans at 19.7% Interest. I don't think I committed to do to a commercial on top of that" and characterized the Republican reaction as "unnecessary and out of place". In 2014, Chrysler started using a new slogan, "America's Import" in ads introducing their all-new 2015 Chrysler 200, targeting foreign automakers from Germany to Japan with such ads (German performance and Japanese quality), and at the ending of selected ads, the advertisement will say, "We Built This", indicating being built in America, instead of overseas. Chrysler re-introduced the Town & Country nameplate in calendar year 1989 as a luxury rebadged variant of the Dodge Grand Caravan/Plymouth Grand Voyager minivan for the 1990 model year and continued to sell this incarnation of the Chrysler Town & Country until the end of the 2016 model year when Chrysler reintroduced the Pacifica nameplate for their minivan in calendar year 2016 for the 2017 model year run. Starting with the 1984 models, Fifth Avenue production was moved from Windsor, Ontario to St. Louis, Missouri. Beginning in late 1986 through the 1989 model year, they were manufactured at the American Motors plant in Kenosha, Wisconsin (purchased by Chrysler in 1987). The Fifth Avenue also far outsold its Dodge Diplomat and Plymouth Gran Fury siblings, with a much greater proportion of sales going to private customers, despite its higher price tag. Production peaked at 118,000 cars for 1986 and the Fifth Avenue stood out in a by-now K-car dominated lineup as Chrysler's lone concession to traditional RWD American sedans. Chrysler re-introduced the Town & Country nameplate in calendar year 1989 as a luxury rebadged variant of the Dodge Grand Caravan/Plymouth Grand Voyager minivan for the 1990 model year and continued to sell this incarnation of the Chrysler Town & Country until the end of the 2016 model year when Chrysler reintroduced the Pacifica nameplate for their minivan in calendar year 2016 for the 2017 model year run. 1990 saw the previous relationship between New Yorker and Fifth Avenue return, as the Fifth Avenue became a model of the New Yorker. There was some substantive difference, however, as the New Yorker Fifth Avenue used a slightly longer chassis than the standard car. The new New Yorker Fifth Avenue's larger interior volume classified it as a full-size model this time; despite having smaller exterior dimensions than the first generation. 1990 also saw the return of hidden headlamps which when off were concealed behind retractable metal covers. Hidden headlamps had not been available since the 1981 R-body New Yorker Fifth Avenue. For 1990, Chrysler's new 3.3-liter V6 engine was the standard and only choice, teamed with the company's A-604 four-speed electronic automatic transaxle. Beginning in 1991, a larger 3.8-liter V-6 became optional. It delivered the same 147 horsepower as the 3.3, but had more torque. 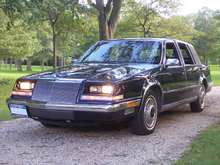 The early 1990s saw a revival of the Imperial as a high-end sedan in Chrysler’s lineup. Unlike the 1955–1983 Imperial, this car was a model of Chrysler, not its own marque. Based on the Y platform, it represented the top full-size model in Chrysler's lineup; below it was the similar New Yorker Fifth Avenue, and below that was the shorter wheelbase New Yorker. The reintroduction of the Imperial was two years after the Lincoln Continental was changed to a front-wheel drive sedan with a V6 engine. Other domestic competitors in this segment included the Cadillac Sedan de Ville/Fleetwood, Oldsmobile 98 and Buick Electra/Park Avenue, all of which shared General Motors' then-flagship C platform. Initially, the 1990 Imperial was powered by the 147 hp (110 kW) 3.3 L EGA V6 engine, which was rated at 185 lb⋅ft (251 N⋅m) of torque. For 1991, the 3.3 L V6 was replaced by the larger 3.8 L EGH V6. Although horsepower only increased to 150 hp (112 kW), with the new larger 3.8 L V6 torque increased to 215 lb⋅ft (292 N⋅m) at 2750 rpm. A four-speed automatic transmission was standard with both engines. This generation Imperial was a 6-passenger sedan offered in either velour or Mark Cross leather. Power equipment came standard, as did automatic climate controlled air conditioning, anti-lock brakes, cruise control, driver's side airbag, and its distinct landau vinyl roof. The Imperial featured hidden headlamps behind retractable metal covers similar to those found on the LeBaron coupe/convertible and New Yorker/Fifth Avenue. The Imperial was available with a choice of several Infinity sound systems, all with a cassette player. Other major options included fully electronic digital instrument cluster with information center, electronically controlled air suspension system, and remote keyless entry with security alarm. Dealer-installed integrated Chrysler cellular phones and six-disc CD changers were also available. Introduced in May 1993 for the 1994 model year, the Chrysler LHS was the top of the line model for the division, as well as the most expensive of the Chrysler LH platform cars. All the LH-series models shared a 113.0-inch (2,870 mm) wheelbase and were developed using Chrysler's new computer drafting system. The car was differentiated from the division's New Yorker sedan by its bucket leather seats (the New Yorker had a bench seat) and standard features such as alloy wheels that were options on the New Yorker. Further differences between the Chrysler LHS and its New Yorker counterpart were a floor console and shifter, five-passenger seating, lack of chrome trim, an upgraded interior and a sportier image. From the 1996 model year on the New Yorker was dropped in favor of a six-passenger option on the LHS. The LHS received a minor face change in 1995 when the corporate wide pentastar emblem was replaced with the revived Chrysler brand emblem. Standard features of the LHS included a 3.5 L EGE 24-valve 214 hp (160 kW; 217 PS) V6 engine, body-colored grille, side mirrors and trim, traction control, aluminum wheels, integrated fog lights, 8-way power adjustable front seats, premium sound systems with amplifiers, and automatic temperature control. Unlike the New Yorker, leather seats were standard. The first generation of the Concorde debuted at the 1992 North American International Auto Show in Detroit as a 1993 model. It debuted as a single, well-equipped model with a base price of US$18,341. Following FCA's acquisition of Chrysler, FCA set a long-term goal of reviving the Chrysler brand as a full luxury brand to compete again with Cadillac and other luxury brands. The company stated in October 2009 that future plans for Chrysler brand vehicles include closer cooperation and shared development between Chrysler and Lancia, an upscale Italian automaker within the Fiat Group. In 2011, the brand's winged emblem was modified, eliminating the historic blue ribbon center which dated from the 1930s, replacing it with a blue-backed "Chrysler" nameplate. In May 2014, FCA announced it would make the brand a mainstream brand with premium features. The brands current lineup consist of the Chrysler 300 and the Chrysler Pacifica. In 2010, Fiat Auto was planning to sell seven of its vehicles in the U.S. by 2014, while Fiat-controlled Chrysler Group was to supply nine models to sell under Fiat brands in the European market, according to a five-year plan rolled out on April 21, 2010 in Turin, Italy, by Fiat and Chrysler CEO Sergio Marchionne. At least five of the Fiat Auto models were expected to be marketed in the U.S. under its Alfa Romeo brand. Showing the level of integration envisioned, a product introduction timeline envisaged Chrysler-built compact and full-size SUVs going on sale in 2012 and 2014, respectively, in both European and North American markets. First introduced as MyGig, Chrysler Uconnect is a system that brings interactive ability to the in-car radio and telemetric-like controls to car settings. As of mid-2015, it is installed in hundreds of thousands of Fiat Chrysler vehicles. It connects to the Internet via the mobile network of Sprint, providing the car with its own IP address. Internet connectivity using any Chrysler, Dodge, Jeep or Ram vehicle, via a Wi-Fi "hot-spot", is also available via Uconnect Web. According to Chrysler LLC, the hotspot range extends approximately 100 feet (30 m) from the vehicle in all directions, and combines both Wi-Fi and Sprint's 3G cellular connectivity. Uconnect is available on several current[when?] and was available on several discontinued Chrysler models including the current Dodge Dart, Chrysler 300, Aspen, Sebring, Town and Country, Dodge Avenger, Caliber, Grand Caravan, Challenger, Charger, Journey, Nitro, and Ram. In July 2015, IT security researchers announced a severe security flaw assumed to affect every Chrysler vehicle with Uconnect produced from late 2013 to early 2015. It allows hackers to gain access to the car over the Internet, and in the case of a Jeep Cherokee was demonstrated to enable an attacker to take control not just of the radio, A/C, and windshield wipers, but also of the car's steering, brakes and transmission. Chrysler published a patch that car owners can download and install via a USB stick, or have a car dealer install for them. Chrysler's quality and customer satisfaction ratings have been below average according to Consumer Reports and JD Powers since the late 1990s. Consumer Reports has consistently reported Chrysler brands at the bottom of their reliability ratings in the past decade as well as their Automotive Brand Report Card. JDP has found similar results over the same time period in both Initial Quality Studies and Customer Service Indexes as has the American Customer Satisfaction Index survey. Chrysler has had a few quality successes during this period. Strategic Vision named Chrysler an overall winner in 2015 noting strong customer appeal and that with the rise in quality of all cars the difference between high and low "problem-counting" ratings are relatively small. In 1992, Chrysler developed the Dodge EPIC concept minivan. In 1993, Chrysler began to sell a limited-production electric minivan called the TEVan; however only 56 were produced. In 1997, a second generation, called the EPIC, was released. It was discontinued after 1999. In September 2007, Chrysler established ENVI, an in-house organization focused on electric-drive vehicles and related technologies which was disbanded by late 2009. In August 2009, Chrysler took US$70 million in grants from the U.S. Department of Energy to develop a test fleet of 220 hybrid pickup trucks and minivans. The first hybrid models, the Chrysler Aspen hybrid and the Dodge Durango hybrid, were discontinued a few months after production in 2008, sharing their GM-designed hybrid technology with GM, Daimler and BMW. Chrysler is on the Advisory Council of the PHEV Research Center, and undertook a government sponsored demonstration project with Ram and minivan vehicles. In 2012, FCA CEO Sergio Marchionne said that Chrysler and Fiat both plan to focus primarily on alternative fuels, such as CNG and Diesel, instead of hybrid and electric drivetrains for their consumer products. Fiat Chrysler bought 8.2 million megagrams of U.S. greenhouse gas emission credits from competitors including Toyota, Honda, Tesla and Nissan. It had the worst fleet average fuel economy among major manufacturers selling in the USA from model years 2012–2018. During World War II, essentially all of Chrysler's facilities were devoted to building military vehicles (the Jeep brand came later, after Chrysler acquired American Motors Corporation). They were also designing V12 and V16 hemi-engines producing 2,500 hp (1,864 kW; 2,535 PS) for airplanes, but they did not make it into production as jets were developed and were seen as the future for air travel. During the 1950s Cold War period, Chrysler made air raid sirens powered by its Hemi V-8 engines. One of Chrysler's most significant contributions to the war effort was not in the field of vehicles but in the radar field. For the final production design of this antenna and its highly complex drive mechanism, the Army's Signal Corps Laboratories turned to Chrysler's Central Engineering Office. There, the parabola was changed from aluminum to steel, allowing production forming using standard automotive presses. To keep weight down, 6,000 equally spaced holes were drilled in the face (this had no effect on the radiation pattern). The drive mechanism was completely redesigned, using technology derived from Chrysler's research in automotive gears and differentials. The changes resulted in improved performance, reduced weight, and easier maintenance. A large portion of the Dodge plant was used in building 1,500 of the SCR-584 antennas as well as the vans used in the systems. In April 1950, the U.S. Army established the Ordnance Guided Missile Center (OGMC) at Redstone Arsenal, adjacent to Huntsville, Alabama. To form OGMC, over 1,000 civilian and military personnel were transferred from Fort Bliss, Texas. Included was a group of German scientists and engineers led by Wernher von Braun; this group had been brought to America under Project Paperclip. OGMC designed the Army's first short-range ballistic missile, the PGM-11 Redstone, based on the WWII German V-2 missile. Chrysler established the Missile Division to serve as the Redstone prime contractor, setting up an engineering operation in Huntsville and for production obtaining use from the U.S. Navy of a large plant in Sterling Heights, Michigan. The Redstone was in active service from 1958 to 1964; it was also the first missile to test-launch a live nuclear weapon, first detonated in a 1958 test in the South Pacific. Working together, the Missile Division and von Braun's team greatly increased the capability of the Redstone, resulting in the PGM-19 Jupiter, a medium-range ballistic missile. In May 1959, a Jupiter missile launched two small monkeys into space in a nose cone; this was America's first successful flight and recovery of live space payloads. Responsibility for deploying Jupiter missiles was transferred from the Army to the Air Force; armed with nuclear warheads, they were first deployed in Italy and Turkey during the early 1960s. America's more ambitious manned space travel plans included the design of the Saturn series of heavy-lift launch vehicles by a team headed by Wernher von Braun. Chrysler's Huntsville operation, then designated the Space Division, became Marshall Space Flight Center's prime contractor for the first stage of the Saturn I and Saturn IB versions. The design was based on a cluster of Redstone and Jupiter fuel tanks, and Chrysler built it for the Apollo program in the Michoud Assembly Facility in East New Orleans, one of the largest manufacturing plants in the world. Between October 1961 and July 1975, NASA used ten Saturn Is and nine Saturn IBs for suborbital and orbital flights, all of which were successful; Chrysler missiles and boosters never suffered a launch failure. The division was also a subcontractor which modified one of the Mobile Launcher Platforms for use with the Saturn IB rockets using Saturn V infrastructure. This page is based on the Wikipedia article Chrysler; it is used under the Creative Commons Attribution-ShareAlike 3.0 Unported License (CC-BY-SA). You may redistribute it, verbatim or modified, providing that you comply with the terms of the CC-BY-SA.